Look what we have for your viewing pleasure this week! Pre-made meatballs! Ah, the convenience, right? So what’s the big deal with frozen meatballs? Plenty. Let’s discuss a few of the ingredients in this product. The top three ingredients are mechanically separated meat, textured soy protein and glucose.The first ingredient is mechanically separated pork, beef and chicken. What in the world does “mechanically separated” even MEAN???!!! Mechanically separated meat( MSM) is a paste-like meat product produced by forcing beef, pork, turkey or chicken, under high pressure through a sieve or similar device to separate the bone from the edible meat tissue. For the production of chicken and turkey MSM, most of the time, breast carcasses are used as they still contain parts of breast meat. Check out this picture of mechanically separated chicken (aka “pink slime”). Another ingredient in these meatballs is textured soy protein. Textured soy protein is a popular meat substitute among some vegetarians. It is high in protein and low in fat but it is a soy product. Soy products may in fact pose health risks for individuals with soy or gluten intolerances. Although few studies have been performed on the effect of soybeans on human hormones, some medical practitioners advise men and women with hormone imbalances to avoid soy products, such as textured soy protein, tofu and soy milk. Many soybean products also contain enzyme-inhibitors that can block the absorption of certain enzymes used for digesting protein. One other ingredient is dextrose. Dextrose, also called glucose, is a simple carbohydrate that is quickly absorbed by the body and rapidly promotes the production of insulin. Therefore, dextrose is considered to have a high glycemic index. Something else to keep in mind is that the meats used in this product are not organic, local, grass fed, free range or otherwise beneficial to your health in any way. It is so much better to make your own meatballs! The really great thing about them is that you can make a bunch and then freeze them. And honestly, doesn’t pretty much EVERYONE love meatballs? 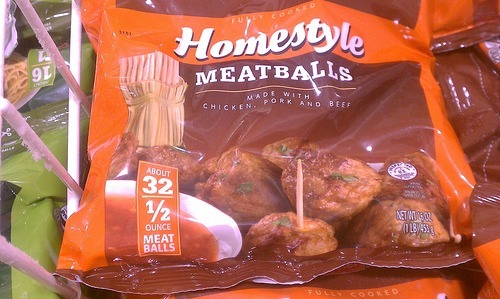 Not only are they great in spaghetti and meatballs, but they are yummy tucked into a pita for a tasty lunch! Here’s a wonderful Clean Eating Meatballs recipe that your whole family will love.